Washington, DC—Palbociclib and ribociclib are 2 cyclin-dependent kinase (CDK)4/6 inhibitors approved by the FDA for the treatment of patients with hormone receptor–positive/HER2-negative (HR+/HER2–) breast cancer. A third CDK4/CDK6 inhibitor, abemaciclib, is currently in phase 3 clinical trials, and other drugs in this class are in varying stages of development. As these drugs are introduced into the clinic, an active area of research is the identification of biomarkers for response that would inform oncologists about which patients are likely to respond. Thus far, investigators have come up empty in the search for response biomarkers. At the 2017 meeting of the American Association for Cancer Research (AACR), an analysis of patients enrolled in MONALEESA-2, a phase 3 clinical trial of ribociclib (an orally available CDK4/CDK6 inhibitor) plus letrozole versus letrozole alone failed to identify a biomarker for response to ribociclib. 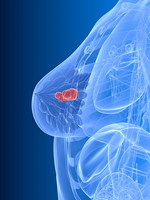 MONALEESA-2 enrolled 668 postmenopausal women with HR+/HER2– advanced breast cancer who had received no previous therapy. Women were randomized 1:1 to letrozole plus ribociclib versus letrozole plus placebo. Fifty-nine percent of the population had visceral metastases. Archival tumor tissue was required at study entry, and biomarkers were part of an exploratory end point of the trial. Results showed that ribociclib plus letrozole improved progression-free survival versus letrozole alone. Median progression-free survival was not reached in the ribociclib-containing arm, and was 14.3 months for letrozole alone. Fresh or archival tumor tissue was used in the study of the first set of biomarkers. At the AACR meeting, lead investigator Fabrice André, MD, PhD, Professor, Medical Oncology, Institut Gustave Roussy, Villejuif, France, reported on results with 6 biomarkers, such as expression of Rb, p16, and Ki67 protein levels, and CDKN2A, CCND1, and ESR1 gene expression levels. Tumor samples were available as follows: 479 samples for Rb, 405 for p16, 463 for Ki67, and 386 samples for CDKN2A, CCND1, and ESR1 gene expression. The investigators also looked at progression-free survival according to PIK3CA expression in circulating DNA. Ribociclib plus letrozole was consistently more effective than letrozole, but no differential effect of ribociclib was observed according to any of the biomarkers studied. Additional biomarkers will be studied, Dr André said. Audience member Hope S. Rugo, MD, Director, Breast Oncology Clinical Trials Program, University of California San Francisco Helen Diller Family Comprehensive Cancer Center, and lead investigator of the MONARCH-1 study of abemaciclib, asked Dr André whether changes in these markers over the course of disease could be a partial explanation of the inability to identify a biomarker for ribociclib. “That could be one of the explanations. I personally believe that the usual strategies to find predictive biomarkers for CDK4/6 will fail. It is possible that we need to detect subclonal changes in expression with a phosphoprotein assay as a first step,” Dr André said. Filipa Lynce, MD, Medical Oncologist, Georgetown Lombardi Comprehensive Cancer Center, MedStar Georgetown University Hospital, Washington, DC, said biomarkers are needed to identify nonresponders and patients who can be treated with endocrine therapy alone. “In MONALEESA-2, progression-free survival was better with ribociclib, but the investigators failed to identify a subgroup of patients who can benefit. Perhaps it would be better to study patients with primary resistance or those who will do well on endocrine therapy alone,” she suggested.